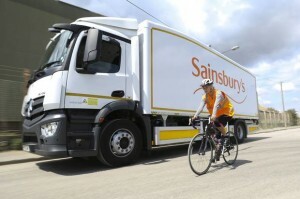 Sainsbury’s launches a lorry designed specifically for the safety of cyclists and pedestrians. The vehicle – which will be unveiled by Mayor of London Boris Johnson at City Hall – features 360 degree monitors, extra side lighting for road users at night and low side guards for cyclist safety. It was designed in collaboration with Solomon and Mercedes.